Details on the company's first-quarter earnings results -- straight from DreamWorks executives. Following a 31% surge over the prior three months, DreamWorks (NASDAQ:DWA) stock slipped last week after the animated filmmaker posted first-quarter results. 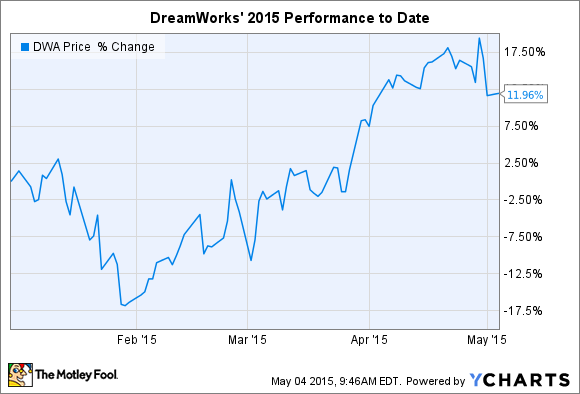 Yes, DreamWorks beat Wall Street's revenue expectations. But the company also lost $55 million as it spent heavily on restructuring the business. After the announcement, CEO Jeffrey Katzenberg and his executive team held a conference call with analysts to put those results in context. Here are five highlights from that discussion. DreamWorks' only feature film release of the year came through in spades for the company. It has collected over $150 million in U.S. theaters, which is a fantastic showing for a fresh property that isn't a sequel. In fact, it is already DreamWorks' highest-grossing new film in six years. And the movie is doing just as well internationally. Home opened at No. 1 in 32 countries around the world and has secured the top animated film spot in 13 of those markets, including Russia and the United Kingdom. Foreign exchange swings took a bite out of Home's reported profit -- and out of the company's overall results. During the call, Katzenberg used the example of the Russian ruble, which has depreciated significantly against the U.S. dollar this year. In local currency, Home was the company's top grossing film of all time in Russia. However, it failed to meet that mark after translating results back into dollars. DreamWorks credits part of Home's success to a marketing push that resonated particularly well with audiences. Stars Jim Parsons, Rihanna, and Jennifer Lopez all mobilized their massive social media fan bases. And Lopez' American Idol singing event was a big success, attracting more than 40 million views on YouTube. "Fox just hit it out of the park," Katzenberg said about the Home marketing plan. "They just did an outstanding job." DreamWorks' output deal with Netflix is a big reason why the company thinks it can grow TV revenue to $250 million this year, with a profit margin north of 30%. The company delivered 40 episodes to Netflix in 2014 across four TV series. This year, that production will spike higher. In addition to season two of each of these shows, DreamWorks will deliver seven more series. Investors can expect most of the financial benefits from these sales to occur in the third and fourth quarters. Management stood by its prediction that 2015 will be a breakeven year for the company -- excluding the restructuring charges that DreamWorks is taking to organize the business for lower movie production volumes. Its TV division will be key to that result, as will the home entertainment performance of recent feature films. Next year's profit or loss will revolve around DreamWorks' two scheduled movie releases, Kung Fu Panda 3 in March and Trolls in November.